"Is that it? Oh, it's not is it? I don't know, I don't know, I can't tell!" Toni Duchi nervously paced the floor of the University Park General Aviation terminal along with the rest of the volunteers and their families, peering out the windows in the hope of catching a glimpse of a descending airplane. Every black speck that appeared in the wintry, overcast sky sparked a burst of excitement as the crowed awaited the plane carrying the newest members of the Nittany Greyhound family. "If it isn't, I'm going to have a heart attack, right here, right now," Duchi said. After what seemed like an eternity -- thankfully there was no sign of cardiac arrest -- a plane touched down loaded with the precious cargo they had all been waiting for -- six retired racing greyhounds. 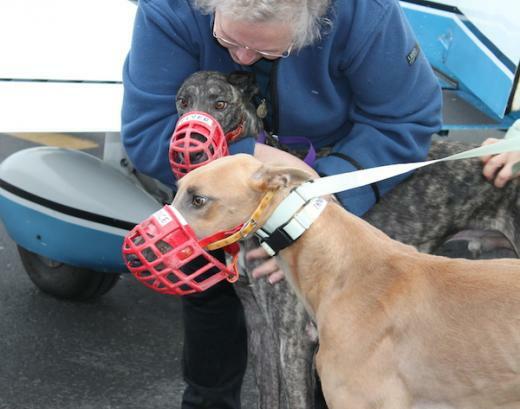 Arriving at the University Park airport from Orlando on a single engine, six passenger aircraft, the dogs were greeted with hugs and cheers from volunteers at Nittany Greyhounds, a non-profit organization that has been finding homes for ex-racing dogs for 16 years. With names like "Flyer", "Pilot", and "Cherokee" labeled on their protective muzzles, the dogs leaped off the plane and into the arms of the volunteers, who loaded them into the warm, blanketed company van. Finally, after a five-hour, 800-mile flight, they were headed for their new home at the twenty-acre Roo Valley, complete with a kennel, a house, and a barn. "I'm buzzing," Duchi said. "I'm so excited, I can't stand it. This is a first. We have over one thousand people on our Facebook page, and I think every single one of them is holding their breath just waiting for this happen." "Everybody's excited, apprehensive, and I'm nervous, and just thrilled - thrilled to death that we don't have to drive ten hours to pick up dogs," Duchi added. "I'd rather drive ten minutes. It's the best. It's just the best." This was the first time the group had used a plane to transport Greyhounds. The flight was the remarkable result of a collaboration between Nittany Greyhounds and Brave Tide, a non-profit charitable organization committed to strategic humanitarian efforts, including transport and rescue of animals in need. "It's historic for us," said Nittany Greyhounds president Ellen Aschenbrenner. "It's sort of like when we used to get the dog hauls on the big trucks, and everybody would be there all excited to see the new dogs." Jason Hilt, president of Brave Tide and pilot of the aircraft, said he contacted Nittany Greyhounds to see if he could fly a few retired greyhounds from a track in Orlando to their kennel just five miles from State College. Having used rental planes to transport one to two dogs at a time in the past, he didn't have the capacity for half a dozen furry passengers. But thanks to a grant from pet supplies retailer Petco, he was able to purchase his own airplane in December - a Piper Cherokee Six. "Unless we turned around and looked, we didn't know they were there," Hilt said of the dogs, who he would check on every thirty minutes throughout the flight. "They were great. No barking, no fussing. They just settled down." "As long as you have them barricaded in the back so that they can't get up into your lap," Duchi pointed out. "The really hard part is when they want to drive." Hilt, whose organization also carries water, food, and whatever is needed in the case of a natural disasters, as well as provide education and scholarships for veterinary students and economically, was quick to deflect the spotlight toward the volunteers and the many helping hands who chipped in to make the momentous flight a reality. "Flying the plane is the easy part," he continued. "Having the volunteers here to bring the dogs into the van, having the volunteers in Florida this morning to get all the dogs to the airport by 7:30 in the morning - it was a group effort." In the past, Nittany Greyhounds would have to drive across the country to pick up and transport dogs to their home in Pennsylvania. Dogs and humans alike would have to pile into a van or a coach bus with its seats removed to make room for the carriers, and drive hundreds of miles with little or no legroom. In fact, had the dogs not been flown in, the trip from State College to Florida and back again would have taken close to four days to complete. "It's nice for the owners because their dogs have been delivered in a timely fashion," Hilt said. "It was probably smoother than driving in a car today. It was that nice for the whole 800 miles." "It's a lot easier on the dogs and the people, because rather than the twenty-two hour drive, it's a five hour flight," added Aschenbrenner. According to Hilt, the cost of the transportation totaled roughly $1,800, which would normally be too much for an organization like Nittany Greyhounds. It depends on donations, sponsors, and various fundraisers to operate. However, Brave Tide offered to pay for for two-thirds thanks in large part to money it receives from Petco, grants, and the community, and a handful of generous donations from people who sponsored each one of the six dogs. As a result, Nittany Greyhounds was left to pay $300 - the price of gas for a road trip to Florida. "There aren't any tracks in Pennsylvania," Duchi said. "The closest one is in West Virginia. We developed a relationship with tracks in Florida, so we have three trainers we work with, and we get dogs from them. Usually they're trucked here to us in a van or dog hauler or whatever. It takes twenty-two hours for them to get here, and this was five hours." "It's so much better for the dogs, it's better for us, it's better for everyone concerned," she continued. "It's an awesome opportunity." Both Hilt and Aschenbrenner agree that this could become a regular arrangement. Due to the ease of transportation and the financial obligations being taken care of by generous donors, sponsors, and what Hilt calls a "tremendous" community, more dogs can make the trip to spend some quality time at Roo Valley before finding a new home. "It's not over mountains or the Atlantic Ocean, and it doesn't depend on the season," Hilt said. "We could do it twelve months out of the year, and maybe two or three each month for this specific group." Hilt, who himself owns a greyhound, believes that what he and Nittany Greyhounds are doing is something that all dog lovers - and animal lovers alike - can appreciate. "Every dog that's adopted leaves a place for another dog that needs a home." C.J. Doon is a frequent contributor to Onward State and is a former StateCollege.com intern. A Long Island native, Doon is studying print journalism at Penn State. 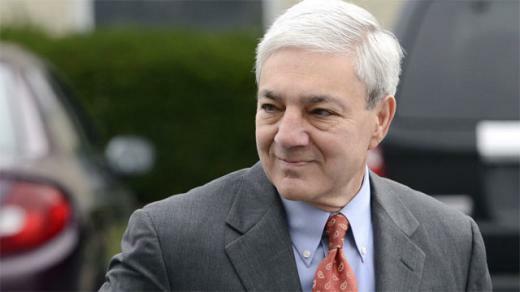 It's a legal setback for three former Penn State administrators charged with an alleged coverup of the Jerry Sandusky child abuse scandal. A judge presiding over the criminal trial has denied a request to prevent controversial grand jury testimony from being used in court.